Farmgirl Fare: Is It A Boy? Is It A Girl? No, It's A Bouncing Baby Blog! No, It's A Bouncing Baby Blog! Yes, that's my little announcement. I've started another blog. It's an offshoot of Farmgirl Fare, very informal, and created for purely selfish reasons. 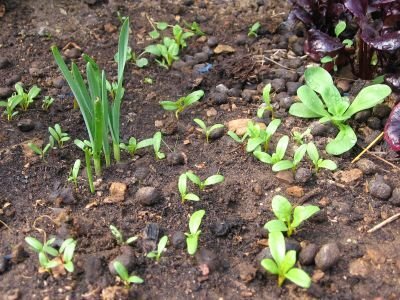 InMyKitchenGarden.com is basically my personal gardening journal--and hopefully a way to get me to start keeping better (any!) records of what goes on each season inside my garden gate. Since our weather here is never, ever the same from year to year, keeping detailed day-to-day records of what goes on seemed (and still is) pointless. But it would be nice to be able to look back at what generally went on in the garden--you know, not just what types of tomatoes I planted, but how they actually did. One of my golden rules of gardening is that I Will Forget All Those Little Things I Swear I Will Remember. It will be nice to not keep making the same mistakes over and over because my pathetic memory forgot all about them (or, more likely, blocked them out). If you're a gardener or a wanna-be gardener, you're welcome to follow along with what's going on in my garden. And by sharing what I'm doing, maybe I can save you some time, trouble, and serious frustrations as well. I have no problem admitting that I screwed up! Of course I welcome your comments, questions, tips, and suggestions. I'm sure I'll be asking for help on a regular basis. Like I said, this new project is supposed to get me to keep track of what's going on in the garden on a regular basis. So if I start slacking off, friendly harrassment is definitely encouraged! Okay, time to get growing. Congratulations! Your new blog may just be a seedling now, but I'm sure it will blossom into something lovely! I will certainly be checking it out! I'm so jealous-- I want a real garden! OH, so now I can email you all the time for garden ER questions? Just when lambing season is over.. I believe it was Maya Angelou who said that the busier we are the more activities we manage to integrate into our lives. And of course she said that in a much more poetic way than I could ever paraphrase it. I look forward to reading your garden blog! what kind of sprouts do you have going there? Your greenhouse and gardens look just wonderful. (I tried to write that earlier but Blogger was being temperamental again.) It's sunny here today. Hurray. Your enthusiasm is just what I need to stay motivated with this new project! Thank you. Looking forward to seeing you over there. Oh I think the chickens will somehow manage to survive, LOL. You're done with lambing? Ha, no wonder I haven't had any emails lately. : ) Send on the gardening ER questions. I certainly hope I won't get rid of you that easily! That larger plant on the right is mache (corn salad), a delicious little salad green that absolutely loves cold weather and is an excellent self-seeder. I don't know what is going on with Blogger (and gmail). I just wrote a long comment on my garden blog and it just kept giving me different word verifications over and over and over and would never publish the comment. I came over here expecting the same thing, did a test, and it published. We'll see if this "real" comment does, LOL. Sun--yay! Even though I love cloudy weather--and so do the plants--I was hoping for some sunshine here today so I could heat up the greenhouse and hang up some laundry outside. Oh well. Ah! Here it comes, poking out its tentative head. Just had to complain a little I guess, LOL. Wonderful news! I look forward to reading all about your garden experiences.